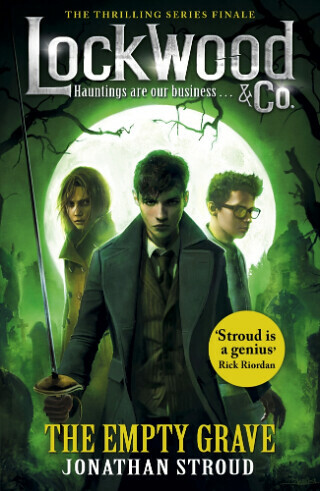 ‘Not everyone will make it out alive…’ it says on the back of Jonathan Stroud’s fifth and last Lockwood instalment, The Empty Grave. Well, that sounded grave enough, and I wondered if Jonathan would have the nerve to kill off someone we know and love, or if it’d need to be a more recent character who could be sacrificed. Or if they lied on the cover. They wouldn’t dare do that, would they? Anyway, at the beginning we find our five friends – six if you count the Skull – bottoms up, looking into a mausoleum to see if the owner of the grave is in. It’s the kind of thing you have come to expect from Lockwood & Co.
Lucy is feeling more serious about Lockwood, and also seriously worried about him. He seems ready to join his parents in their grave, for one thing. Meanwhile, Penelope Fittes is getting on with closing down the competition in sorting out ghosts and hauntings in London, but what Lockwood and his colleagues really want to know is whether she is in fact her own grandmother, Marissa. You know, the one with the mausoleum. There’s a lot of funny business going on. After solving one or two early mysteries, the time has come for the gang to discover what Penelope is up to, really. And the visit to the Other Side in the last book was merely a taster for what happens now. It is just as fun and exciting as the other four Lockwood books. It’s a delight reading about such warm humour and wit, friendship and romance. Even George seems ready to commit. But there is that quote from the back cover to worry about. Who will die? I’ve grown awfully fond of Skull over the years. He’s rude and funny and intelligent, and occasionally quite helpful. It’s a shame he’s dead. This entry was posted in Authors, Books, Reading, Review and tagged Jonathan Stroud. Bookmark the permalink. I loved the Bartimaeus books, which added a whole new dimension to the concept of the footnote but I didn’t get on as well with the first of the Lockwood novels and so haven’t been back. Perhaps I should revisit that judgement and have a feast over one long winter weekend. Well, it could be they are not for you. I ran out of time for Bartimaeus back then, but loved the last standalone one.